I have been attending the classes for three months and since then I have learnt so many things about…ME! 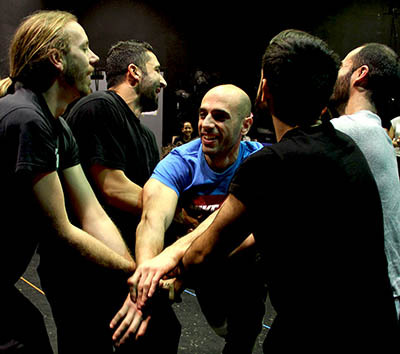 Kostas Kavakiotis is sharing his passion for acting with a big group of enthusiastic people who are hungry for acting, for expressing themselves, for having fun, for being curious!…including me. The classes are sophisticatedly organized to help beginners to improve quickly while at the same time to enjoy the process of learning acting. Moreover, the whole group is harmonically working together, beginners and more experienced students. It is also about challenge! You find out about your weaknesses and your strengths through the classes. You can see your limitations and which personal areas you should develop. Understanding body language, keeping strong eye contact, keeping a positive posture and controlling your movement in favor of your self-confidence are some key points which we work on. It is also about fun!, the classes give you the opportunity to develop yourself while at the same time you are enjoying your time, be creative and be funny! I was impressed and I am still getting impressed in every new class from the fact that a 3-hour class keeps you alert (after 10 hours of work), positive and the most important you never know what is coming next!